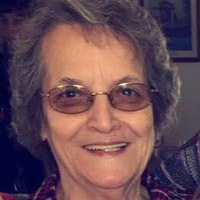 Joann Marie Hergenreter of Berthoud passed away unexpectedly on January 28, 2018. She was born in Arvada, Colorado to Jennie and Roxy Ditolla. Joann’s motto in life was “Live, Laugh, Love.” She will be remembered by family and friends as a “Peacemaker.” Joann loved to travel with her twin sister Josephine. She volunteered at the Berthoud Senior Center for the past 15 years. She served as Chairman of the Board. She also organized all the fundraising events. Joann is survived by her husband Bill of 53 years, her 3 sons, Jeff (Donna), Mike, Billy (Sarah) and daughter Rhonda (Shawn). She has 9 grandchildren, Seth (Jen), Sean, Jackie, Colton, Lauren, Shelby, Jacob, Jennea and Emberley. She has 3 great grandsons, Ayden, Blake and Kade. She is also survived by 10 siblings. Dorothy Richardson of Deer Park, Washington, Jim Ditolla of Puyallup, Washington, her twin sister Josephine Murray of Brighton, Hank Ditolla of Des Moines, Iowa, Mike Ditolla of Lewiston, Montana, Betty Samora, Peggy Aranjo, Debbie Noriega, Marcie Guadiana, Marty Hinshaw all of Fresno, California and many nieces and nephews. Services will be held at St. John Catholic Church in Loveland on Friday, February 2, 2018. Viewing at 10:00 a.m. and Mass Service at 11:00 a.m. In lieu of flowers please donate to St. John Catholic Church or Berthoud Senior Center in memory of Joann Hergenreter.